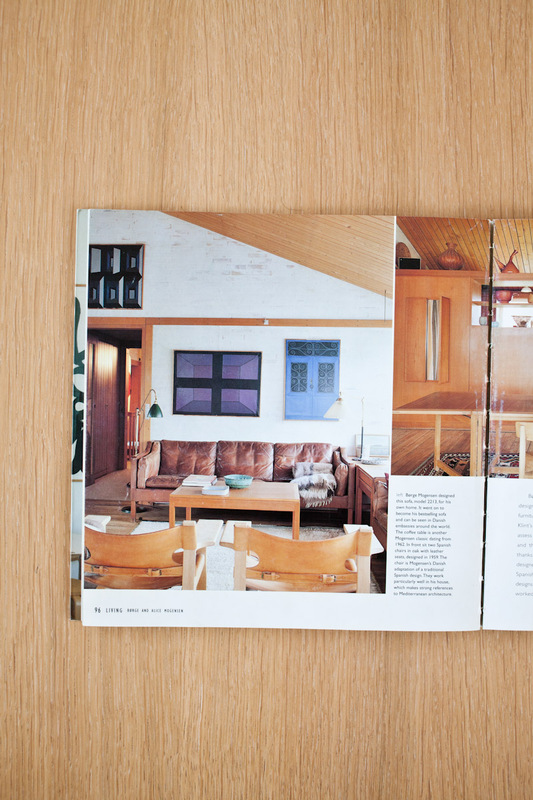 Are you familiar with the book “Scandinavian Modern” written by Chrystina Schmidt and Magnus England? 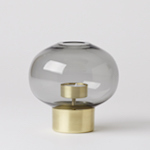 It contains some beautiful interiors of some of the most notable designers and architects in Scandinavia spanning from mid-century homes to current dwellings. 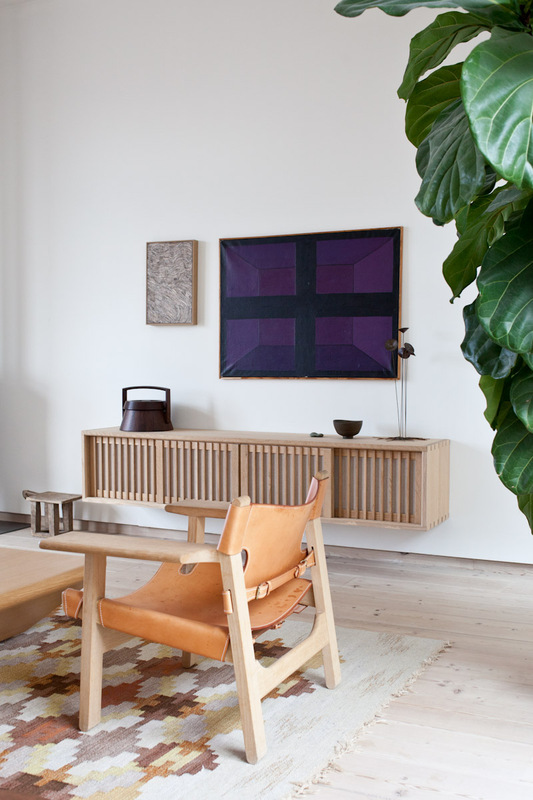 The photograph above is from my favourite article, which is the home of Børge and Alice Mogensen, it is especially beautiful since the home itself (designed by Børge Mogensen) is a beautiful blend of Danish and Japanese design sensibilities, and also includes all their personal effects and art, all in perfect harmony within the space. The photograph above is of particular significance, as you can see it has been opened to this page so many times the binding has broken which means when opening the book it naturally wants you to settle here. 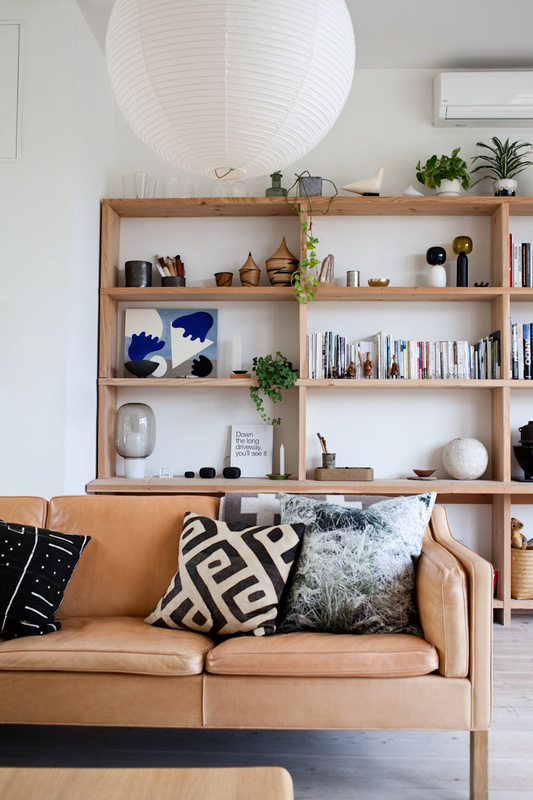 This is where we show a lot of our customers what a Mogensen sofa will look like in 40+ years, and how natural materials get better with age. It also in some ways gave us the courage to buy our own 2213 sofa, and as a direct result of that experience of buying a sofa from Denmark and having a lot of trouble during the process bringing it over to Canada, it gave us the idea to open our own shop bringing in Scandinavian furniture and crafts from Japan. 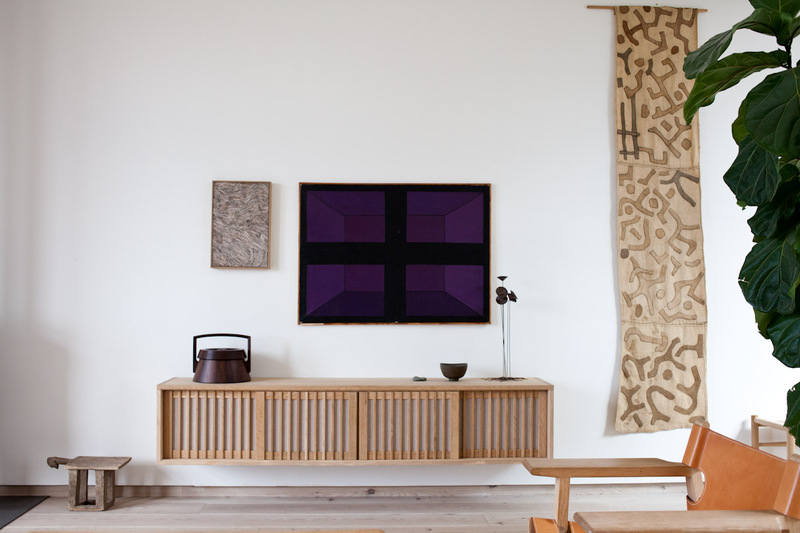 I don’t know how many times I’ve looked at these images of Mogensen’s home, first obsessing over the furniture, and then the rugs and pottery, trying to find out who designed them… Then the artwork on the wall, who made these pieces? 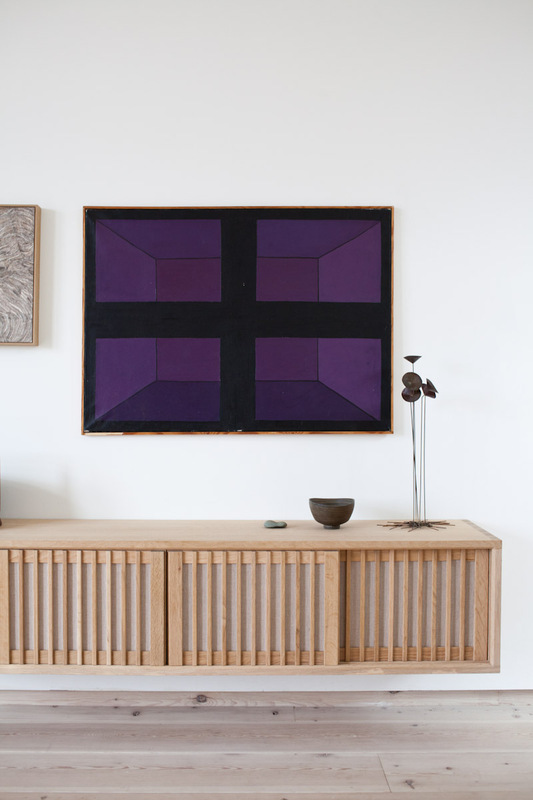 Particularly that purple modernist painting… How would you ever go about finding the name of the artist? Unfortunately Alice Mogensen died a few years ago, and the home was sold along with all of the personal contents which were sold at auction. For better or worse, the home has found a new and different life, and we will never get to see it as it once was. I personally think the Mogensen home should have become a museum like Finn Juhl’s home, or Alvar Aalto, but of course I don’t know the circumstances and cannot speculate further. 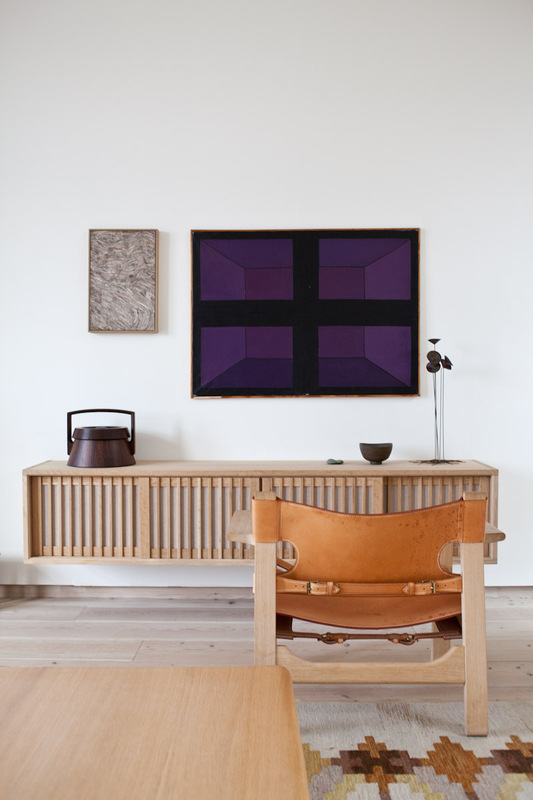 If these pieces were to disperse around the world it would seem very fitting that fate would find us and give us the opportunity to secure the exact painting we had been so captivated by in Mogensen’s home for years. Recently I was searching for Mogensen pieces online and serendipitously stumbled across a listing for this exact painting! The artist is Albert Mertz, and the name of the painting is “The Abandoned Space”, painted in 1962 and presented during an exhibition in Denmark, of work that the Danish painter had done while living in Paris. All of the other paintings in the room are also by Albert Mertz, possibly acquired from the same opening. The Spanish chair in front of the painting. Our new-ish Mogensen 2213 sofa slowly turning that famous cognac colour, although it will take many more years. We feel very lucky to be able to have this work in our home, and have a little part of the interior that inspired us so much in our life.